By now, we know what to expect from an Example single: A singy bit, a rappity rapping bit, a bit for "da club", a big old chorus and lyrics that really make you think about what you are feeling. 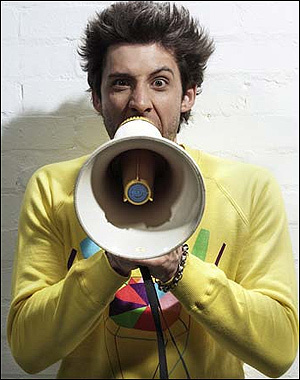 His new single, Say Nothing, ticks all of those boxes, and some other boxes we hadn't associated with Example before, eg the box for people who steal the "woah-oh-ah-oh" bit off Coldplay's Viva La Vida. This blatant commercialism might ruffle a few feathers but, as Example has said on many occasions, he wants to make dance music that works in stadiums. In that context, cribbing from Chris Martin's Big Fun Scrapbook of Rock Cliches ("Chapter four: Paul McCartney always finishes with Hey Jude for a reason") isn't such a bad idea. Lyrically, I'm particularly enamoured with the line: "We used to have our eggs sunny side up / But the fun dried up". Because nothing expresses the head-first depth charge of falling in love more accurately than a plate of fried eggs. Nothing.